The main UKL news items I know of are the ones I mentioned on the home page: the release of Le Guin's new novel The Telling, and the long-awaited VHS/DVD release of Channel Thirteen's 1980 film version of The Lathe of Heaven. In the latest novel in the Hainish cycle, Sutty, an Observer for the interstellar Ekumen, has been assigned to Aka, a world in the grip of a materialistic government. The monolithic Corporation State of Aka has outlawed all old customs and beliefs. Sutty herself, an Earthwoman, has fled from a similar monolithic state -- but one controlled by religious fundamentalists. Unexpectedly she receives permission to leave the modern city where her movements were closely monitored. She travels up the river into the countryside, going from howling loudspeakers to bleating cattle, to seek the remnants of the banned culture of Aka. As she comes to know and love the people she lives with, she begins to learn their unique religion -- the Telling. Finally joining them on a trek into the high mountains to one of the last sacred places, she glimpses hope for the reconciliation of the warring ideologies that have filled their lives, and her own, with grief. The Telling is a reflection on the conflict of politics and religion in our modern world, and the story of a spiritual journey through a landscape that is at once very strange and very familiar. I've also heard a rumor that there's going to be a book tour for The Telling. In fact, for all I know it's happening as we speak. If anyone out there knows anything about this, please share! Drop me a line at dayvoll@ocelotfactory.com. On to Lathespecifically, the film version of UKL's Taoist SF parable The Lathe of Heaven, which was adapted by NYC's public TV station Channel Thirteen in 1980. 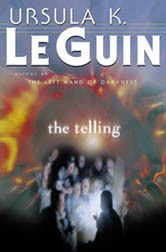 (You can read Le Guin's own account of the filmmaking process in her book of essays Dancing at the Edge of the World.) Some of you may be familiar with the saga of this long-lost SF film classic, which prior to its release on VHS and DVD this summer (yes, it's now available on Amazon) had only been shown a few times on PBS stations back in the early '80s. It then disappeared into the mists of legend, because Channel Thirteen in producing it hadn't cleared the rights for more than a few broadcasts, let alone video release. The major stumbling block, as I understand it, was the film's use of The Beatles' original recording of "With a Little Help From My Friends." Acquiring the rights to use that recording on a video release were apparently very, very expensive, and difficult to obtain. So the film languished in the vaults until this summer, when public pressure organized by the very resourceful Jane E. Hawkins finally convinced Channel Thirteen to do what was necessary to release the film. It's wonderful to have the film available, and I very much enjoyed having the opportunity to watch it again, since it had such an enormous impact on me when I first saw it at age 14. But unfortunately, what was necessary for Channel Thirteen to release the film turned out to be removing the Beatles track and replacing it with an alternate version of the song that is every bit as smarmy and annoying as the Beatles' original is charming, poignant and uplifting. I'm trying not to let that ruin the joy of having the film available again; but it does seriously undermine what I remember as the film's most emotionally powerful moment back when I first saw it. Sigh. Maybe it's worth tracking down some of those overpriced, blurry dubs on eBay after all. Well, I don't want to end this column on a downer. So I'll say that Beatles song or no Beatles song, the film is still a remarkably inventive and faithful adaptation of the book, the cast is remarkably strong and it's a huge kick to see George Orr ably portrayed by such a young, slender, ingenuous Bruce Davison (almost unrecognizable as the Bruce Davison who did such an equally fine job as the nasty senator in this summer's X-Men film). Also, the DVD version has an interview with UKL, which is giving me extra incentive to save up for a DVD player. Most of the better video stores seem to have gotten the film in stock, so if you're hesitant about laying out dough for the film unseen, give it a rental and take a look. Okay, I lied at the top of this thing. I now have one other piece of news. Well, actually it's two or three interconnected pieces. (Oh, just get on with it, yoz.) According to an interview I just found on the Web, UKL spent the spring semester of this year as writer-in-residence at San José State University. The interview (in the SJSU Spartan Daily) goes on to say that in addition to The Telling, a book of short stories set in Earthsea is scheduled for release this fall. The interview gives the title as Tales from Earthsea. I found no indication of this on Amazon, which usually has info on books several weeks prior to release. Maybe the release date has been pushed back? Let's hope it's in the pipeline somewhere. In the meantime, the story goes on to say that UKL is working on a fifth novel of Earthsea, tentatively titled The Other Wind. You can read the complete interview on the SJSU site. If you know of Ursula K. Le Guin news items that should be on this page, by all means send them to me at: dayvoll@ocelotfactory.com.